Content marketing is the backbone of SEO that has been emerged as a promotional marketing tool. Duplicate content is a major bump for SEO as google always strives to provide original content and informative to the visitors. 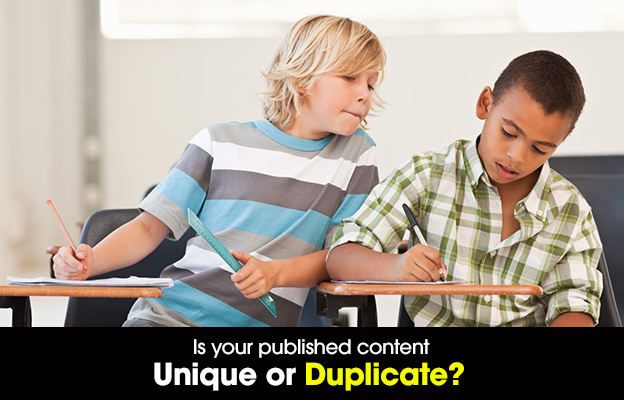 The content that appears more than one place on the internet is called duplicate content. It can be available in different forms like mirror sites, reusing content, content syndication and content scrapping. One can easily handle duplicate content of its own site also called On-site duplicity but it’s difficult to handle when different sites duplicate your content which is also known as off-site duplicity. URLs and Session IDs: Click tracking is one of the URL parameter that may cause issues of duplicate content. It occurs mostly in e-commerce sites where generic product description is used i.e. manufacturer-supplied copy. E-commerce sites allow users to store shopping items in the shopping cart which is stored in distinct session for each user. The assigned session ID is unique and identifies the pages and actions that are performed by the user. When some systems fall back to the URLs and session IDs then the problem occurs because every internal link gets appended to the URL and that unique session ID which will results in the creation of new URL and duplicate content. Sorting and Pagination: Price or date sorting is done during online shopping. Sometimes both URLs are same i.e. URL for sorting option and original URL that points to the same page. Pagination involves breaking up long content into short pieces, with a navigation system to go to the next or previous piece. E-commerce sites divides the large category of products into different pages and these pages will end up having same title, description and content. WWW and non-WWW: Search engines may get it wrong when both www and non-www version of site are accessible. New Website built by a web designer: When you’re getting a new website built from an individual or a company, at times some of these individuals add content from other similar websites and publish on your website pages trying to act as if they have provided you complete content inclusive in there web design & development fee. But the fact is that they copied the content from multiple sites and publish it to your new site making it a classic duplicate content website for Google. The main resource of duplicate content is search engine try to crawl all identical pages but with session IDs or tracking IDs same page generated number of times. This will decrease the chances of be in listing. Duplicate content can be avoided by adding canonical link elements to duplicate page, adding HTML link from duplicate page to the canonical page and by redirecting duplicate content to canonical UTL. Have a look on these tools that can be used to avoid duplicate content issues in order to accomplish smooth communication with search engine, delayed website rankings and decreased crawl rate. Google Webmaster Tools:- Google Webmaster tools is a free web service from Google with which webmasters can check their indexing as well as optimize website’s visibility. It helps you to show duplicate content in Meta description and title description. Log in to Google Webmaster tools by using your Gmail account. Now click diagnostics followed by HTML suggestions and you will see complete information about Meta description and title description. It will show you all duplicate URLs when you click on any of the link. Siteliner:- By using siteliner you will get a complete report of duplicate content, broken links, related domains and skipped pages. You just need to enter the URL of the site and click on “Go”. To get an overview of the title, URLs, links, match words, percentage and match pages, Click on “Duplicate Content” in site details section. Screaming Frog:- Including duplicate content issues screaming frog crawl 500 pages. To get a list of URLs which have copied content you need to click on the page titles and select duplicate in the filter section. Virante Duplicate Content Checker:- To check your site’s internal duplicity you can use Virante Duplicate Content Checker that can scan your site by submitting your domain. It performs 404 check, PR dispersion, Google cache check, supplemental pages in Google index and www versus non-www check by checking the headers returned by both versions of the URL. Xenu:- Launch Xenu Sleuth. Go to File and click on Check URL. It will start crawling URLs as soon as you click on OK. It is used to check broken links. See the table to check similar titles, save the file and export it to MS-Excel. SmallSeoTools:- To check how original your content is you can use small SEO tools. You have to copy and paste your content in the box on the tool. Now click on “Check for Plagiarism”. The content that have been copied from elsewhere will be marked red. To see the source click on the highlighted text. Combining pages by focusing on relevancy and popularity is one of the best solution to duplicate content issues. Don’t let your pages weigh you down as there is enough keyword competition between sites. Also, Unique and informative content will give needed boost to the website.